So there I was a few weekends ago, wandering around the indoor hall at the UK’s National Hamfest (held just outside Newark). I had just left some items at the Bring and Buy, was browsing the stalls and I came across the stand of the Group for Earth Observation, where I stopped for a chat with the two guys on the stand. I used to be a member quite a number of years ago until, for whatever reason, I lost interest, after a short chat, I purchased a few recent copies of their quarterly magazine and headed into the crowd. On the ferry home I opened them for a look and instantly thought I had to make an effort again. So, when I got home I joined GEO (again), found my old licence and login details for Eumetsat. 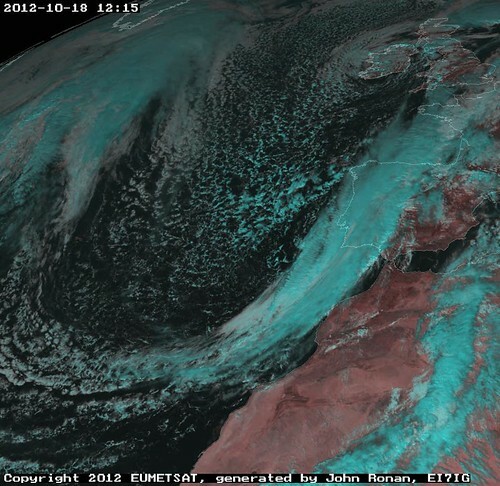 Downloaded and compiled xrit2pic and put my licence to use. Once Mr B. drops me back my Ezcap eztv 688, I will have to try it on good old APT. Thank you GEO for re-kindling my interest (though my wife may not agree. Hmmm… I wonder if she would mind me putting up a dish for EUMETCast reception. ). Well, not quite, but you will understand when you read this. Bertrand, F5PL, recorded the tone of the Radio Carrier from Mars Express as it approached Phobos. Great work from an “Amateur”. The Feb. 27 magnitude 8.8 earthquake in Chile may have shortened the length of each Earth day. JPL research scientist Richard Gross computed how Earth’s rotation should have changed as a result of the Feb. 27 quake. Using a complex model, he and fellow scientists came up with a preliminary calculation that the quake should have shortened the length of an Earth day by about 1.26 microseconds (a microsecond is one millionth of a second). More. Also, as a result of the earthquake, there is a lot of activity on Amateur Radio frequencies of 7050, 7060, 7088, 7095. As there is a contest next weekend, please listen carefully before using these frequencies. More. I have always been interested in the shuttle missions. There is, I guess a natural curiosity about anything to do with space. I’ve observed a few launches that passed through the sky’s over Ireland. I saw STS-127 on the launchpad, and then streaking across the sky over Ireland. What I hadn’t done (before yesterday) is listen to voice communications from the Orbiter directly. I’ve tried a few times, but not really persisted. Yesterday at approximately 09:30 I snagged the following Audio Clip on 259.7MHz AM. Suffice it to say, it made my day. Many thanks to the Hearsat folks for putting up with my dumb questions. Also I must agree with Hugh, it was probably the prettiest launch I’ve ever seen. Wow, time sure is flying by December 31st already. Let me see, things of note. Cormac is building a Millenium Falcon (very cool). Scott has released his new Weather Station, the ADS-WS1. I finally got my head around ALSA’s dsnoop plugin on Linux, which is very handy when trying to stream and record from the same device. I’ve spent the last two days pulling as many of my MP3’s off a dying drive as possible while playing with an AOR AR5000 that Santa brought me (good man Santa!). Hope-1 was launched on 14th December. 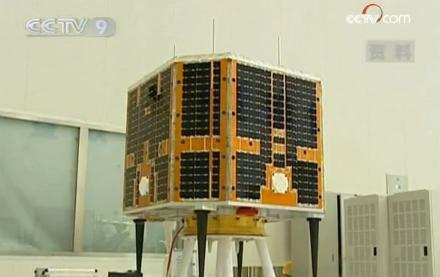 This is a big deal as it is (to my knowledge) the first Amateur Satellite launched from China. STS-127 launched this evening, and for the first time ever I saw the orbiter and tank as they were going overhead, What a fantastic sight! Having seen it on the launchpad recently, I guess it made it a bit more ‘personal’. A massive project to bounce voices from Earth to the moon and back to another spot on Earth will be launched June 26. Several former astronauts and other famous people have signed on, and so can one lucky Wired Science reader. We’ve secured a spot for one Tweet to be bounced off the moon, so send your most space-worthy 140 characters to @wiredscience or e-mail betsy_mason@wired.com. The winner can go to a moon bounce station to personally send the message to the moon. We have a Radio Rally (Called a Hamfest in the USA), this Sunday, and I was looking around my shack thinking that I should probably bring some unused gear in and sell it on. I spied my Icom PCR-1000. It has been sitting pretty much unused since Dxtuners closed earlier this year, so it was a prime candidate for re-sale. I had been using Steve’s PCRD for remote control which is fine, but I was looking for something (Linux based) better for use in the shack (and have too little time to write something myself at the moment). I did a quick Google and found this python app by James Ahlstrom. It is just what I was looking for, thanks James, my PCR1000 shall remain, now I just need to learn some Python! Wow, what a busy two weeks. I spent last week preparing for the GAISS field trial. Which was reasonably succesful, though I’m knackered after it. I was also acting as “Net Control” for the “Base” VHF/UHF Radio Station that we had set up for the weekend. Technically I had the easy job as I wasn’t actually walking, though I was wearing ‘many hats’ for the weekend (WIT/AREN/TARG). Scott N1VG’s prototype OT2’s and T2-135’s worked very well over the weekend. And we had better voice communications than previous years, so we will call it a success on all fronts. I have a few pictures available here, most of the pics were supplied by others. As a quick test, I downloaded the latest version of radvd, same problem, my guess now is that it is a kernel (2.6.17.10) issue. It will have to wait until after the weekend, or SWMBO will shoot me. Now, I think I’ll try and catch an hours sleep before the STS-117 launch later on this evening. About 20 minutes after launch, it should be possible to hear voice communications on their downlink frequency of 259.7MHz AM. Feel free to have a listen at http://193.1.193.156:8000/PCR1000, your could also come join in the ‘fun’ with the uhf-satcom crowd, see http://www.uhf-satcom.com/ for details.